First Threading/Lacing - Four Ways Including Free, Compostable and Natural. What are the first threading/lacing materials you use at home or in your classroom? Perhaps threading beads? With Otis we used pasta (penne) and cotton reels but with Otto, I noted that it was easier if the items where much thinner. Otto's first threading activity was using the wood pieces pictured above. 1. Wooden Disks - completely natural, handmade by a small business. I love the texture too. If you had a drill this could be a DIY. 2. Oversized Buttons - later these will be useful for colour and language work. These also stack so could be used like colour tokens and for patterning. I love observing the toddler's development of the pincer (fantastic to see Otto!). Also, the concentration was so good on this one. I strongly believe that toddlers are capable of deep concentration and that a child who is able to concentrate will be calmer, more satisfied and fulfilled. 3. Wheel/Rotelle Pasta - these were free (well, they were in our cupboard) and are completely biodegradable/compostable. They are on the small side but it just makes it a little more challenging (see Otto's grasp). I don't put these on Otto's shelves but keep them in the kitchen and pull out when needed. 4. Milk Lids - I used a nail and a hammer to make the hole in the lid and then inserted a skewer to make the hole larger. I didn't have many lids but I will start collecting and perhaps see if I can find cartons with different colour lids. Why buy when you can reuse! We already had the shoelace so this was free. Five Minute Montessori - Give the Child a Brush! In our home we use brushes everyday. We use them for scrubbing, brushing and general cleaning! Why not offer your child the opportunity to clean alongside you or perhaps give the child their own brushes for their own work? 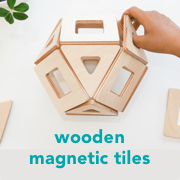 It's an easy way to introduce five minutes of Montessori into your day! There are many child-size brushes available and they can make a difference, they are easier for the child to use and coordinate, but don't let not having a specific child size bush stop you or your child. Using a brush can be good for developing fine and gross motor skills, coordination, building strength and concentration! Using a brush can give the child skills to participate in a meaningful way in care of self (brushing hair or cleaning nails) or care of the environment (cleaning, washing tables) activities. Here are some examples of ways a child can use brushes around the home! Dishwashing Brush - consider a glass washing brush or bottle brush if you are washing lots of glasses or bottles. Your child can wash a few dishes while you prepare dinner. Nail Brush - we always have a nail brush in the boys' bathroom for cleaning nails while in the bath or when handwashing. Hair Brush - a low mirror can help a child when brushing their own hair. Dustpan and Brush - good for cleaning up any little spills or crumbs on the floor. Broom or Whisk Boom - look for indoor and outdoor sweeping opportunities. Shoe Brush - why not leave in the shoe basket, mud room or entry way to clean dusty or dirty shoes, also use for shoe polishing. Baking/Pastry Brush - suitable for oiling a pan, or for putting on egg-wash.
Scrub Brush - for washing tables or provide a separate scrub brush for washing floors. A child could also use a soft brush to clean their toys (provide a warm bucket of soapy water) or scrub down their trike or outdoor toys. Vegetable Brush - often mushroom brushes are small and suitable for a child to scrub vegetables. Scrub root vegetables such as unwashed potatoes or carrots from the garden. Paint Brush - we provide lots of different sizes to encourage experimentation. Gluing Brush - for young children we provide a small brush or applicator to use with glue and only present glue sticks to older children. Table Brush - for brushing crumbs off the dining table (often comes with a small dustpan for the crumbs). Clothes or Laundry Brush - perfect for removing lint (especially for special occasions or on formal clothes). Pet (Cat, Dog, Small Animal) Brush - to groom and care for pets. 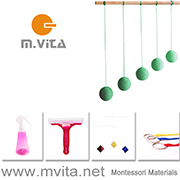 Stores like Montessori Services (US) or Absorbent Minds (UK) stock many child-size brushes however they can also be found at a low cost in specialist kitchen stores or homeware stores. In Australia, Saison has a fantastic range of high-quality brushes suitable for children. Some types of brushes can be used for alternative purposes so keep an open mind, some standard pot brushes or vegetable brushes may work well as a child's scrubbing brush - just make sure the child knows what each brush is to be used for. Remember the child will need a demonstration on how to use each brush and you may need patience, scrubbing or sweeping often involves a new movement that may take a while for the child to master! Five Minute Montessori - Go Get a Magnifying Glass! OK, this is a really easy one. Ready? Do you have a magnifying glass? Good! Go and get it and put it in a basket with a few interesting things. Got it? Perhaps in a basket (or a tray) with some fabric scraps, wool, cotton or silk. Perhaps in a basket with some shells, flowers from the garden or leaves or seedpods. Perhaps in a basket with a few vegetables or herbs. The more interesting and attractive to the child the better! A young child such as a toddler might need some help, perhaps a demonstration on how to hold the magnifying glass but for most children they will get it simply by using it (most children have a tendency to hold it too close to their face or too close to the object). Above Otis is viewing some beautiful shells (always a favourite under the magnifying glass!). He's also noticing how large his hand looks when viewed under the magnifying glass! A simple tray using lots of our favourite items from the nature basket. Sticks, seed pods, pine cones and mini cones, feathers and a small nest. I love the nature theme and the different textures on display. Rocks and minerals. What I love about this tray (especially for a really young child) is we have used a bug viewer which has 5 x magnification (c/o Child.com.au) which makes it really easy for the child to view the object magnified. Otis loves playing around with this, bug viewers are not only for bugs! And most of all I love it when the children pick and choose for themselves, collecting what is around them to look under magnification. Also seen here are two sets of bug viewers and the Duo-Scope Microscope. Five Minute Montessori - Give the Child some Tongs! Introducing tongs to a child as young as eighteen months is a great way to build hand strength, develop fine (finger, hand) and gross motor (arm, shoulder) skills, build coordination and provide an opportunity to cross the midline. Using tongs with transfer work allows the child through repitition to develop focus and concentration! All of these tongs (pictured above) are from Amazon or Montessori Services. Although I recommend having a look if you are near a kitchen specialty store - often it's easier to get a feel for the tongs in person. Searching mini tongs, sugar tongs, ice tongs or cake tongs may help too. Some of these pictured are mini metal tongs which are suitable for transferring and picking up small items. Some of the bamboo tongs are adult size however an older child will have some success with them. For a very young child I recommend tongs without latches. Otis started using tongs as a toddler and you can see he still needs to concentrate when he uses them now. Otis is at the stage where all of his transferring work needs to be purposeful. Transferring food is the most common way we use tongs. Fruit (for snack), vegetables, cake, salad, cheese (cubes for snack or grated as a garnish), bread rolls (at the dinner table) or for serving meals. Prepared practical life trays are valuable if you have a child, possibly a younger child who is interested in them. Otis is currently working on his pencil control so I know that activities that build hand strength are really beneficial. Transferring work with tongs (gripping the tongs, squeezing to pick up the items then release) uses a similar action and muscles to cutting with scissors, which can be really useful for a toddler or young child who is still to master scissor work! Best of all this work usually only takes a few minutes and can be incorporated into everyday life. Above Otis is using an older version of these tongs. Through our school holidays (January) I am hoping to maintain a posting schedule of three times a week - Monday, Wednesday and Friday. I love blogging daily so I will see how long I last! Matching, identifying and naming herbs! This is one of my all time favourite activities and it's perfect to do at home where herbs may be abundant. Our garden has some of these herbs which Otis can identify immediately. However there are a few here he isn't so familiar with. Otis is in the sensitive period for language and using the cards is a great way to introduce the written language and reading to this activity. When working with this activity I also see if Otis can identify the herbs using smell only. Once I found the right sized box this activity took me less than five minutes to make. A cardboard box with two holes (for the chid's arms) = Montessori Mystery Box. This is a fun game that depending on the child can last anywhere from five to fifty minutes. The idea is to isolate the child's sense of touch. They can identify objects by touch only. We like to play this in lots of different ways. By the child feeling a box with lots of items. As they touch or discover with their hands each object they try to identify it. Or you can say to them "can you find me the pinecone" and they need to search for that one item. Or the child can have one object and identify it by touch. We like to use household objects, fruit and vegetables, model animals, items from our nature basket (a soft feather is a nice contrast to a rough seedpod, a cool metal spoon is a contrast to a soft play silk). As you can tell our geometric solids are also popular right now. If the child tries to peek in the arm holes paper or fabric can be attached to the edge of the cardboard cut-out or you could use felt or paper like at this DIY post at Family FECS or using a tissue box as at Montessori Moments. Otis says "this is a cone", I ask "why is it a cone", Otis replies "it has a circle here and flat here and a point here" (as he touches the wooden shape). It's a lovely, peaceful activity to do together. Why would we bother playing a game like this? Maria Montessori in The Discovery of the Child writes at length about the importance of educating the senses "The training of the senses must begin in the formative period of life if we wish to perfect them later through education and make use of them in any particular human skill". "To learn a craft, especially if it is of an artistic or refined nature, means that one must develop his senses and the movements of his hands, and these movements are assisted by a consequent refinement of the sense of touch". She further goes on say the ages of three to six is "when there is a natural inclination to perfect one's senses and movements". In my last order from Karla I asked her to pop in a set of folding cloths for Otis. I didn't use them with Caspar (although he would have had access to them at school) and I really wish I did. I think I've mentioned previously that Otis has a tendency to rush his work, while enjoying the task he is quick to finish and move onto the next thing. I'm hoping the folding cloths can be just one of many activities where I can show him how slowing down and being accurate/precise is important. Folding cloths like this would be easy to DIY, the stitching could be done by hand or replaced by some permanent marker. The stitching/lines are there to guide the child to fold the cloths in several different ways. The demonstration part is easy too - using slow, deliberate movements the child can quickly catch on. And the practical implications in the home environment are obvious, the child can move onto folding laundry, folding napkins for table settings or perhaps origami! This is a fun activity for children who enjoy water play. It's great for fine motor skills, hand/finger strength and coordination. It's also really simple to set up at home. We call this the Crocodile Game. Otis and his small metal tongs (from this pack) are the crocodile "snap" "snap" eating the sponge/fish (if you were really clever you could cut the sponge into fish shapes!). It's really just a simple transferring activity, transferring the sponge out of the water and into the small glass bowl. Caspar loved it too - you can see him here. I need to find some more locks to make this more challenging for Otis. He loves it and it can take him a while to get the key in and turn it. A simple lock and key activity. Less than five minutes to prepare if you have some spare locks in your home. Otis thrives on activities like this, an activity which will capture his attention and requires concentration. Concentration is calming and satisfying. In his busy world concentration requires him to slow down, be still. He needs concentration, coordination and strength. He uses size discrimination and memory/recall. He practises grace and courtesy as he brings his tray to his mat and puts it back on the shelf when finished. Perhaps it started with this which is still a daily occurrence.